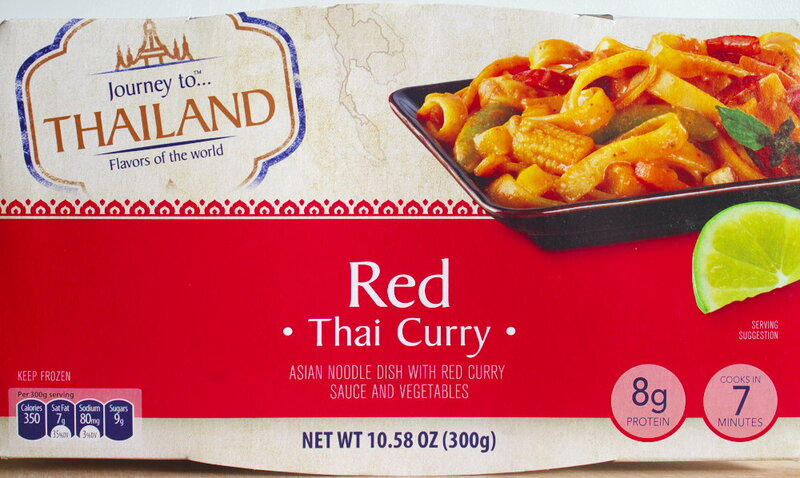 You won’t have to journey to Thailand to find this, but you may have to wait 12 months – or at least until ALDI decides to have this special again. I don’t know how I missed it the first time, but I did find it marked down to $1.25, half price, the next week. Unfortunately when I got back to the store two days later, it was all gone. This is very good. The slight sweetness of the coconut milk contrasts nicely with the spices and moderate heat of the other ingredients in the thin curry sauce. It’s a very good sauce approaching good restaurant quality. Floating in the sauce are big chunks of veggies and big noodles. The wide flat noodles are thicker and wider than a linguine noodle for comparison. The cooked noodles had a nice texture and were cooked just about to perfection. Among the veggies were baby corn, sugar snap peas, carrots and pieces of red bell pepper and mango. Normally I don’t like baby corn, but these were different. First, they were the size where they should be attending kindergarten. Second, they also were correctly cooked and had none of that starchy taste of the smaller baby corn. The microwave cooking directions were different. First, leave the film on and don’t puncture it. Second, the directions are given for a 600 watt microwave. I’m not sure there are many still being sold with that strength. So I had to improvise for my 1200 watt oven. Instead of cooking for half the time suggested at 600 watts, I went long and slow cooking for the full 7 minutes but at 60% power. I know the math doesn’t add up, but I wasn’t entirely sure I had a 1200 watt oven. At any rate, the results were good. This is an independent review of a product purchased from ALDI. The author(s) are customers of ALDI and have no business or other relationship with ALDI. If you have an issue with the product and desire to contact ALDI, either see your local store manager or use the ALDI customer contact URL immediately below to send a message to ALDI. This entry was posted on 06/13/2018 at 02:21 and is filed under ALDI, Recipes, food, cooking and related items. You can follow any responses to this entry through the RSS 2.0 feed. You can leave a response, or trackback from your own site.